How do you adapt to frequent change and still contribute to your company’s success? The answers likely reside in the traits you possess as an IT leader and the corporate culture you promote. We tech leaders must persevere in the face of unique—and often difficult—organizational challenges. In addition to staying ahead of rampant technology changes, you’re under immense pressure to seek cost-cutting solutions that help the bottom line. Let’s not forget a need to safeguard your network against security threats, losing control of some operations to outsourced or cloud services, and every other request that fills your day. Then, as if it wasn’t enough, you’re responsible for plotting technology’s role in the organization’s success. And you’re expected to do it gracefully. How do others make it look so easy? IT leaders don’t get far by letting things slip. They’re doers. Doers always deliver. Most leaders have a deep understanding of who they are inside and out. They know what they’re capable of, as well as their limitations – both as an individual and in the context of the organization. Despite putting out system fires (and everything else eating up every minute of your working day), strong leaders always find time for professional and personal development. For some, that includes ITIL training and certification to maximize effectiveness in IT leadership. KnowledgeWave can help you with that! No single person could possibly know or do everything. The ability to pass along—and trust the completion of—tasks by your team increases your efficiency. IT services reach deep into every department within an organization. Thus, you typically work with a wide variety of staff (and their wide variety of technological understanding). Exceptional communication skills are a must to handle everyone. It’s easy to see right through someone pretending to have leadership qualities. True leaders don’t hide who they are. Instead, they open themselves up entirely – even their shortcomings. Your team, and other members of the organization, look to you to make quality and timely decisions - and back them up with sound reasoning. Check out the full post and reflect on how many of the 16 traits you have already. Which ones could you start improving now? Are there others you’d add to the list? Another trait with deep impact on your IT team—and your entire company—is your contribution to the workplace culture. Niel Nickolasien, CIO at O.C. Tanner Company, views corporate culture as, “the container inside of which work is done.” His article CIO to CIO: Create the Work Culture Your Team Deserves illustrates his personal success as an IT leader. Which he attributes to a full commitment to a corporate culture (of his own design) focused on trust and ownership. That’s counter to some organizations where control is central to its culture – limiting output and growth by requiring permission. How would you classify your own organization’s culture? What improvements could be made by the leadership team if change is needed? What individual contributions can you make to improve the culture? These are the questions exceptional leaders answer to inspire the best results from their teams and the entire company. 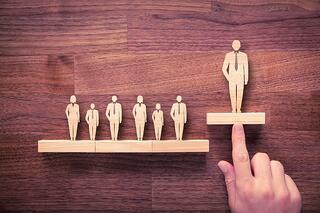 Such thoughtful considerations are what set bosses apart from legendary leaders. Perhaps your culture is anchored in the benefits of learning. If you need certification training for your team, or software training for end-users, KnowledgeWave is here to help.